Editor's note: Today’s guest blogger is Mats Randleff, IT Director for Stockholm, Sweden-based Polygon Group, a global provider of property damage restoration, temporary humidity control and property performance services. When disaster strikes, Polygon Group is often the first call companies make to help restore their facilities and critical documents. We also provide services like humidity control to prevent property damage, and consult on business continuity and disaster recovery plans. Nearly two-thirds of our 2,800-employees are mobile, so we can be on the spot for our customers whenever we’re needed. 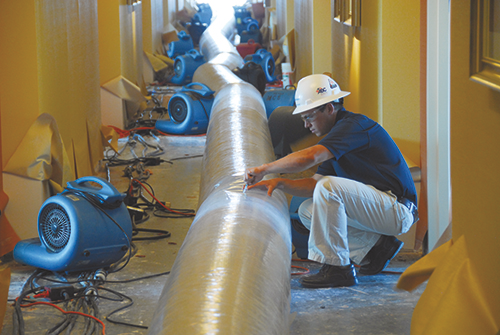 Every minute counts when companies are trying to get back to business after a fire or flood, so our field technicians need reliable communication tools. We used various email systems across our 300 offices, but they needed rigorous IT support to stay up and running. We looked to the cloud for a single system our entire workforce could use and considered Microsoft 365 and IBM SmartCloud (since we’d been using Lotus Notes), but Google Apps stood out as a single, secure system with all the functionality we needed. We believed our employees would quickly embrace Google tools, since Android was already our most widely used platform for mobile devices. When we tested Google Apps with 50 managers throughout Polygon and saw a 95% satisfaction rate, we wasted no time rolling out Apps to more than 1,900 users worldwide. We worked with Avalon Solutions, a Google Apps Premier Partner in the Nordics, who performed the successful migration and roll-out to our global team. Since moving to Apps in spring 2013, we’ve achieved significant cost savings. We’ve reduced travel expenses because our workers use video-conferencing on Hangouts to meet rather than coordinate costly and time-consuming in-person meetings. IT support costs are down, too. In fact, compared to our previous Lotus Notes environment, our cost per user is about 50% less – which translates to about $480,000 in annual savings. Global cooperation has also improved, particularly because group managers have embraced Google Sites as a strategic tool. They’ve created sites for business systems used to report on each group’s operational performance. Managers can monitor financial metrics, key performance indicators, and other information in a single environment that’s easy to use and share. We plan to create sites for our country management teams to track business performance for each region. Google Apps opens up new ways of working at all levels within Polygon, from managers to field technicians. What began as a search for a new email system has evolved into a complete overhaul of our communications. Today, thousands of Polygon employees across more than a dozen countries communicate and collaborate with ease using Google Apps. The greatest benefit for us is that we now can provide a faster, more effective response to businesses in the challenging and courageous position of overcoming natural disaster. At its core, work is about people coming together to fuse ideas, perspectives and passions into broader, rounder visions. It’s about connecting in that sweet spot between inspiration and launch. To achieve this, we have many partners – our teammates – that work together with us every day. To honor our partners and our shared focus to provide more for our customers on every level, we hosted TeamWork 2015. 800 Premier Partners and 200 Googlers joined live with hundreds more tuning in via livestream, for three days of thought leadership, networking, knowledge sharing and, well, teamwork. At TeamWork this year, we took the time to share our vision for 2015 and beyond, shaped by the real-time input of our partners. In December we launched the Google for Work and Education Partner Program, designed to help our partners better innovate across the Google for Work and Education suite of products and platforms. At the summit, we shared full details about this new program and heard directly from partners about what they need to grow in the future. We also shared the news about Android for Work – a new and better way to work on the powerful mobile devices that we carry with us wherever we go, and a vast opportunity for our partners to develop and deliver innovative IT solutions to their customers. Our partners work every day to make sure customers get the most out of the technology and services they use. They’re thought leaders who solve real problems and drive the market forward. 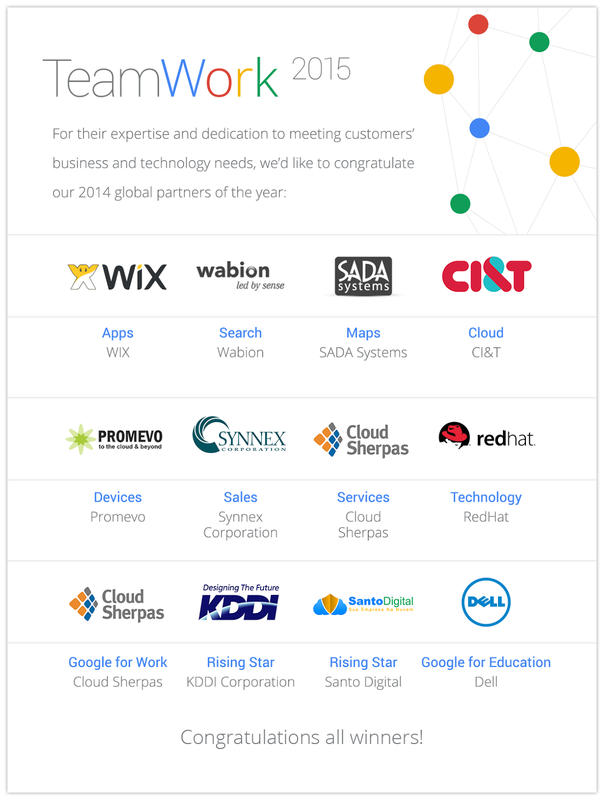 We closed out TeamWork by awarding our 2014 Partners of the Year. We look forward to the work that we’ll continue to do with our partners this year to provide greater tools, services and access for our customers. Check out what partners are saying about this year’s summit by searching #TeamWork2015 via G+ and Twitter. Go team! Work profiles – We’ve built on the default encryption, enhanced SELinux security enforcement and multi-user support in Android 5.0, Lollipop to create a dedicated work profile that isolates and protects work data. IT can deploy approved work apps right alongside their users' personal apps knowing their sensitive data remains secured. People can use their personal apps knowing their employer only manages work data and won’t erase or view their personal content. 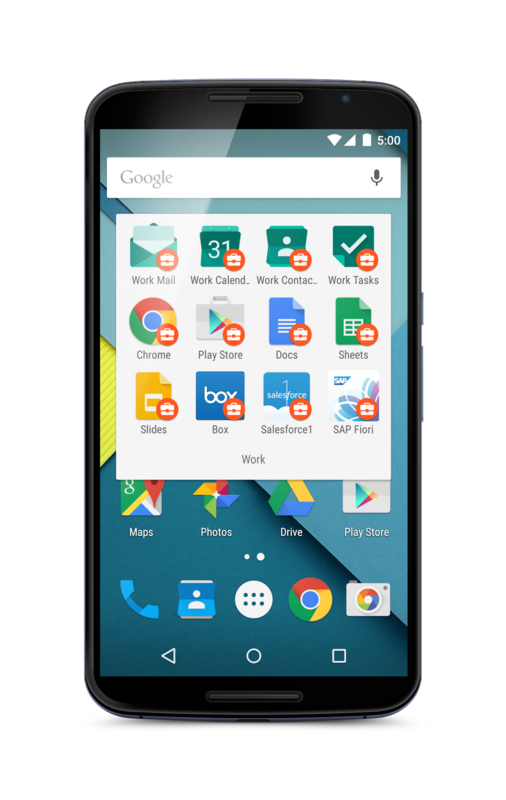 Google Play for Work – Google Play for Work allows businesses to securely deploy and manage apps across all users running Android for Work, simplifying the process of distributing apps to employees and ensuring that IT approves every deployed app. Have you ever felt like your inbox was someone else’s to-do list? Requests, project updates and action items stream in all day. You move between your computer and the phone in your pocket to try to manage, and instead of focusing on the most important things, you find yourself focusing on the most recent things. No matter the device, email should feel like a time saver, but instead it feels like a chore. This is why we created Inbox by Gmail, to help you focus on the things that matter to you. Since we launched five months ago, one of the biggest pieces of feedback we’ve received is that Google Apps customers want access to Inbox at work. That’s why we're excited to kick off the next phase of our journey: collaborating with you to bring Inbox to work. Even before the first invitations went out to use Inbox for your own email, Googlers have been using it to get more done at work. Whether it’s snoozing the expense report notification until after the big presentation, or adding a reminder to schedule lunch with a favorite client, Inbox helps put email on your terms. And since Inbox was built on the same infrastructure as Gmail, it meets the same high security standards you expect from email. Of course, every company and every person is different, so we want to get more input on how Inbox will work at your company. Starting next month, we’ll begin enabling Inbox for a small group of Google Apps customers to learn about their needs, challenges and use cases. Do you want to use Inbox as your primary email at work? Are employees at your company heavy mobile users? Most importantly, do you want to partner with Google on user studies to help build the new work Inbox? If you answered “yes, yes and yes!” then email inboxforwork@google.com from your Google Apps for Work administrator account to apply for an invitation to the early adopter program. To start, we plan to work very closely with the early adopter companies, so not everyone that applies will be accepted right away, but the program will continue to expand over the coming months. Inbox wasn’t created to reinvent email, Inbox was created to help you reinvent the way you get things done. This means we need to understand more about how things get done (or don’t) today. And with your feedback, who knows, we could reinvent the way people work. Note: Only the Google Apps administrator can apply for entry to the Inbox for work early adopter program. Companies of all sizes across a number of industries have come to realize that cloud computing is transforming the way they run their business and how people work together. This is especially true for the healthcare industry, where access to information quickly, accurately and securely is vitally important. That’s why organizations covered by the Health Insurance Portability and Accountability Act of 1996 (HIPAA) rely on Google’s robust infrastructure to store personal healthcare information. We provide the healthcare industry with the tools they need to help address HIPAA compliance and allow employees to have access to their information when they need it, where they need it. HIPAA compliance coverage for Google Apps for Work services includes Gmail, Calendar, Google Drive (including Docs, Sheets, Slides and Forms), Vault and Sites. New and existing Google Apps customers may obtain a Business Associate Agreement (BAA) from our Google Apps Help Center. HIPAA is just one of many regulations and standards Google supports, empowering our customers across different industries to benefit from the cloud. For organizations operating in highly regulated sectors, the use of Google’s services provides the tools and protections needed to meet compliance requirements. Editor's note: Today’s post comes from Henrik Poulsen at Arbejdernes Landsbank, a full service retail bank in Denmark. 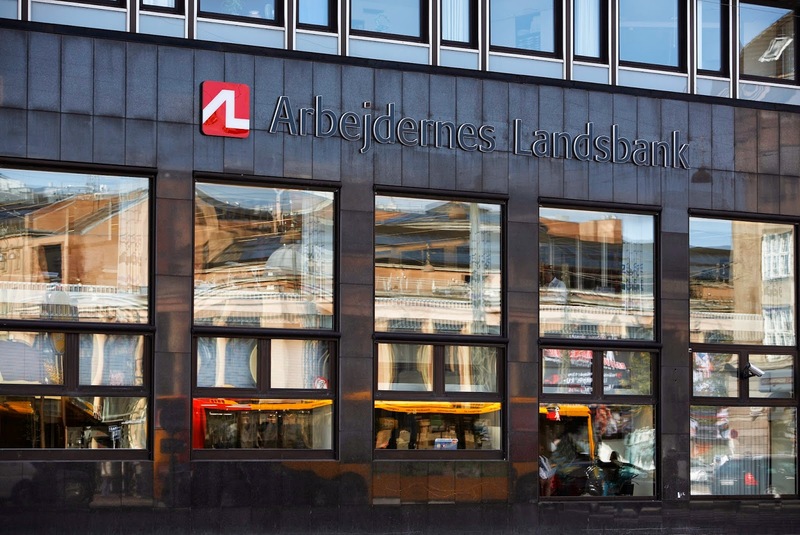 Arbejdernes Landsbank recently introduced Chromebooks to help customers become more digitally savvy. Many people open their mailboxes to find dozens of envelopes from financial institutions with information they can easily find online. As a retail bank, most of our customers are used to receiving bank statements and loan documents via snail mail, but that’s about to change. At the end of 2014, the Danish Government mandated that all citizens receive mail from the public sector online. At Arbejdernes Landsbank, we’re helping our customers adapt to a new era of digital banking in 2015. Before we started prioritizing this digital service, customers struggled to access their online information when they visited a branch location. They had to bring their own devices since using the bank’s devices could expose customer data to security issues. Customers brought different devices with varying network settings, so often our employees spent time dealing with technical computer issues, rather than helping the customer. This was not just time-consuming, but resulted in poor customer service and security issues. Keeping data secure in the financial industry isn’t an option; it’s a requirement. We introduced Chromebooks in January 2015 because they’re secure and easy to use. In each of our 70 branches, we have a Chromebook set up as a kiosk for customers to log onto our website and access income and loan documents, digitally sign customer agreements and refer to electronic statements. We can create a setting so the data one customer accesses is completely wiped before the next customer uses the device. Customers feel comfortable disclosing sensitive information using the Chromebooks because they know their information is safe. Setup for each device requires about two minutes of our IT team’s time, and the device can be managed remotely. Chromebooks help our customers become more digitally savvy while streamlining time-intensive processes, like completing and mailing in paperwork. When a customer needs to access their income information for a loan, they can pull it up online while at the branch, rather than going home and mailing it. Instead of waiting for the next teller, customers help themselves using the Chromebook. Employees spend their time helping customers who need immediate attention, which allows us to deliver higher quality service. Introducing Chromebooks has helped us keep sensitive information secure while providing peace of mind for our customers and familiarizing them with digital banking — all without placing a burden on our IT resources. As we pioneer new digital technologies, we look forward to serving as an educational resource for our customers and making it easier for them to manage their finances anytime and anywhere. Many organizations are in the dark about the security of their data, especially with the rise of shadow IT and numerous recent breaches. It’s no wonder IT execs are concerned about how their data is protected and who has access to their confidential information. There are many layers of security baked into our data center security measures and infrastructure. A very small percentage of Googlers are allowed in our data centers, and even fewer are allowed on the floor where the servers are located. And as they near the core of the data center, they encounter more sophisticated security measures, like biometric scanners and under floor laser beams. From the servers and routers we build ourselves, to the submarine fiber that connects our data centers, to the mobile management of our software interface, our team has control and visibility over the entire chain of technologies. This enables us to detect weaknesses faster and respond to threats that may emerge swiftly. More than 500 security engineers work to protect our systems, while dedicated teams look for malware and vulnerabilities beyond our own infrastructure, in other operating systems and all over the web. For this, we know there is power in numbers, which is why we engage the broader security research community with our Vulnerability Reward Program. In the last year, we paid 1.5 million dollars to security researchers and hackers from every corner of the world to attack our systems and share the vulnerabilities they identified. Information is distributed across our servers and data centers worldwide, so if a single server or even an entire data center fails, your information will still be accessible. Our team is committed to reliability, and the way we built our data model for applications and networks allows us to “replace the engines as the plane is flying,” so we can complete our maintenance while providing an uptime guarantee with no scheduled downtime. Our team has gone to great lengths to build one of the most secure cloud infrastructures in the world. While Safer Internet Day may only happen once a year, we take the trust and security of our customers information very seriously year-round (which we like to share in writing, too). Whether it’s creating easy-to-use tools to help organizations manage their information or keeping customer information safe from prying eyes, we’re constantly investing to ensure that Google earns and keeps your trust. Editor's note: Editor's note: Today’s guest blogger is Goldy Arora, Director of Google for Work solutions at MediaAgility, a technology consulting company building industry specific solutions. See how MediaAgility and other developers are using the Google Maps APIs to bring maps and location content to their users. I love using elegant code to come up with cool applications, but I also know that being a great developer means thinking both like a business person and an engineer. 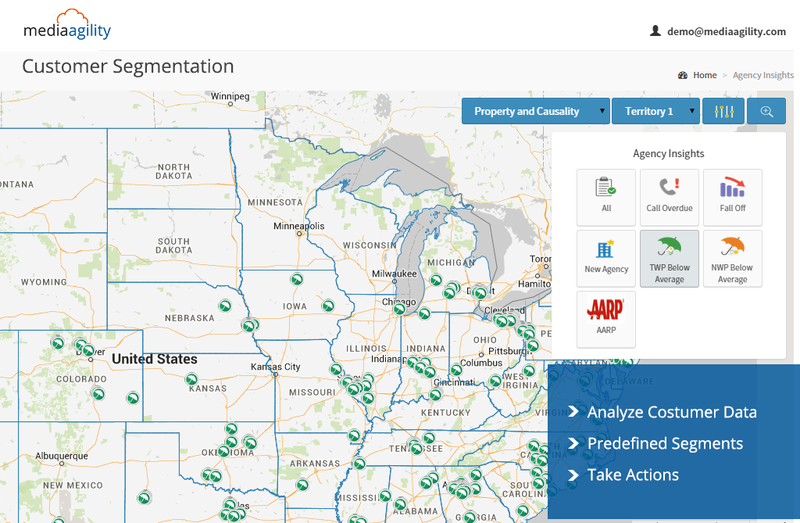 When we create map-based applications at MediaAgility, we think about not just what we are building and how it will look and operate, but why we are building it. How, in other words, do the maps we make meet both our business objectives and make a positive impact on people’s lives? We use the tools in the Google Maps API to develop solutions in a way that helps businesses make sense of data. 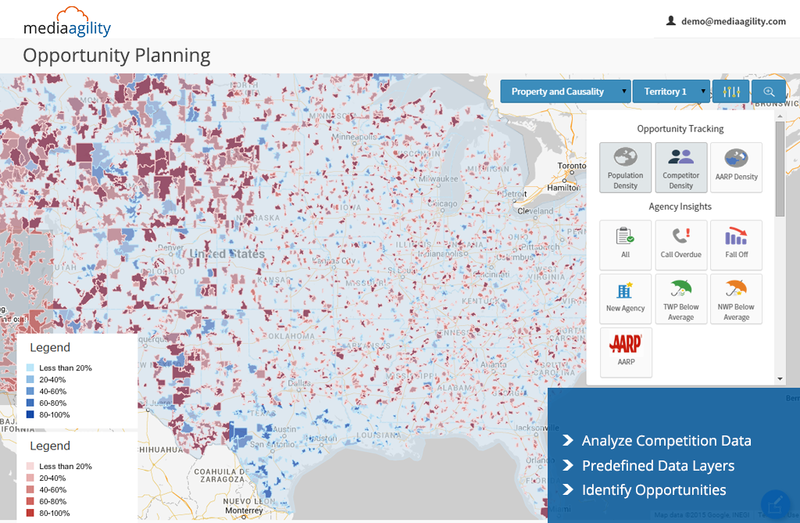 Right now, we’re working on an application called Insurance Insights, which will help sales teams at Insurance companies create campaigns and base decisions on geographic data related to crime, income and natural disasters. Publishing data from multiple sources. We’re adding back-end systems and databases so we can add useful information to Google Maps. For example, we’ve integrated income data for residents, locations of recent natural disasters and sales databases. For this product, we built a script to obtain Salesforce data using their API. Then we employed the Google Maps API to publish the Salesforce data to our maps. Creating multiple viewing options. 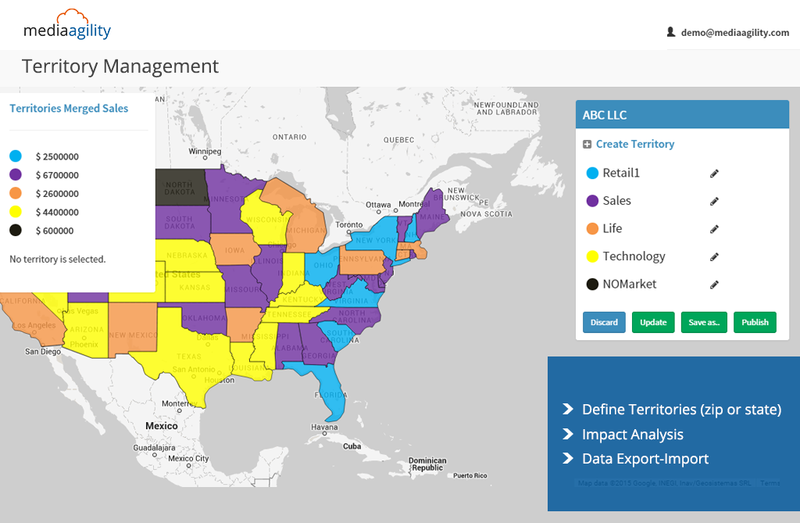 Our map overlays allow users to choose how they want to view the information. An agent may want to market insurance for valuables in high-income neighborhoods, or perhaps offer flood insurance to people in flood-prone areas. They’ll benefit from the insights provided by the various overlays for different marketing campaigns. Erring on the side of more data. We upload as much data as we can. We then call the data with the Maps API whenever we want to test a new feature on the map. Since we are data-ready, we create prototypes within an hour instead of taking days – and build rich, insightful features in less time to market. Experimenting and improving. We iterate frequently to make the best possible product. In the case of Insurance Insights, we created a basic application using Google Maps so we could show it to potential customers. As we work with real market feedback, we add more features. This iterative approach is much smarter than spending six months on an application before finding out if customers like it – we’d rather go to market every six weeks so we know which direction to pursue. Maps are an important part of people’s daily lives, and we're eager to engineer more applications built around new ideas. For example, visual forecasting and pipeline metrics are some of the key features in our next release of Insurance Insights. In many cases, maps are an intuitive and highly visual way to understand a business — much richer and simpler than spreadsheets or presentations. Even if the information is complex, the user experience need not be, all thanks to the Google Maps APIs.